What you are seeing and hearing right now is nothing but a dream. You are dreaming right now at this moment. You are dreaming with the brain awake. Dreaming is the main function of the mind, and the mind dreams twenty-four hours a day. It dreams when the brain is awake, and it also dreams when the brain is asleep. The difference is that when the brain is awake, there is a material frame that makes us perceive things in a linear way. When we go to sleep we do not have the frame, and the dream has the tendency to change constantly. 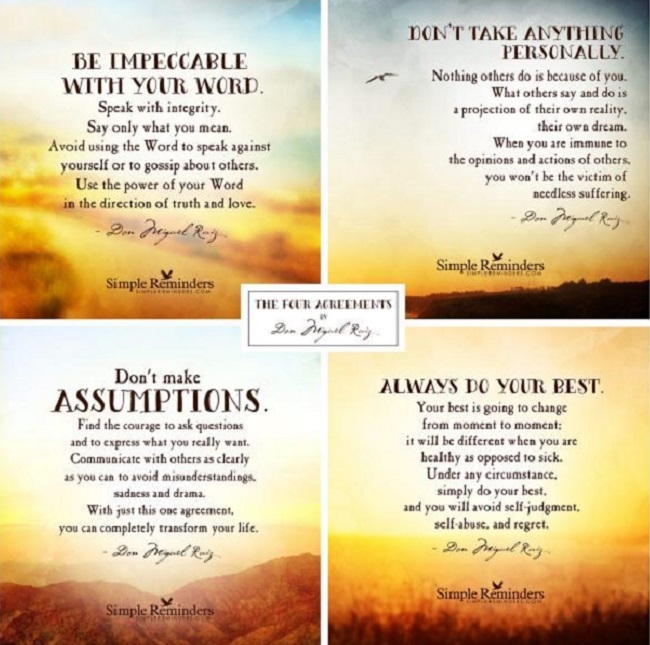 You need a very strong will in order to adopt the Four Agreements - but if you can begin to live your life with these agreements, the transformation in your life will be amazing. You will see the drama of hell disappear right before your very eyes. Instead of living in a dream of hell, you will be creating a new dream - your personal dream of heaven. Speak with integrity. Say only what you mean. Avoid using the word to speak for yourself or to gossip about others. Use the power of the word in the direction of truth and love. Impeccability means ‘without sin.’ Impeccable comes from the Latin pecatus, which means ‘sin.’ The im in impeccable means ‘without,’ so impeccable means ‘without sin.’ Religions talk about sin and sinners, but let’s understand what it really means to sin. A sin is anything that you do which goes against yourself. Everything you feel or believe or say that goes against yourself is a sin. You go against yourself when you judge or blame yourself for anything. Being without sin is exactly the opposite. Being impeccable is not going against yourself. When you are impeccable, you take responsibility for your actions, but you do not judge or blame yourself. Nothing others do is because of you. What others say and do is a projection of their own reality, their own dream. When you are immune to the options and actions of others, you won’t be the victim of needless suffering. Whatever happens to you, don’t take it personally… if I see you on the street and say, ‘Hey, you are so stupid,’ without knowing you, it’s not about you; it’s about me. If you take it personally, then perhaps you believe you are stupid. Maybe you think to yourself, ‘How does he know? Is he clairvoyant, or can everybody see how stupid I am? We have the tendency to make assumptions about everything. The problem with making assumptions is that we believe they are the truth. We could swear they are real. We make assumptions about what others are doing or thinking - we take it personally - then we blame them and react by sending emotional poison with our word. That is why when we make assumptions, we’re asking for problems. We make an assumption, we misunderstand, we take it personally, and we end up creating a whole big drama for nothing. The way to keep yourself from making assumptions is to ask questions. Make sure the communication is clear. If you don’t understand, ask. Have the courage to ask questions until you are as clear as you can be. Your best is going to change from moment to moment; it will be different when you are healthy as opposed to sick. Under any circumstances do your best, and you will avoid self-judgment, self-abuse, and regret. The fourth agreement is about the action of the first three: Always do your best. Under any circumstance, always do your best, no more and no less. But keep in mind that your best is never going to be the same from one moment to the next. Everything is alive and changing all the time, so your best will sometimes be high quality, and other times it will not be as good. The first step toward personal freedom is awareness. We need to be aware that we are not free in order to be free. We need to be aware of what the problem is in order to solve the problem.